so I have the .idb file of an executeable I want to modify. 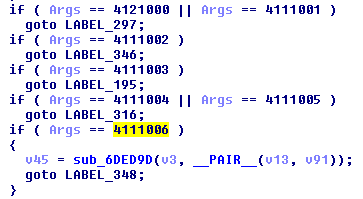 So it shows 4121000 and 4111001 in these segments, but it doesn't show the rest and the one I want to change (4111006), preventing me from finding it in ollydbg / a hex editor and changing it. Is it possible to find 4111006 and change it to a different integer value? If so, how can I do that? Thank you. The way how those IFs are constructed in the assembly is a bit different than what you see in high-level overview in IDA code. Apart from the first one, ifs are represented with subtraction (sub & dec) and jz. because in the first 4 lines (excluding 3rd) you have the first part of the if (standard cmp + jz) and then later a value of 4111001 is subtracted from eax. If it results in zero then we know that the value was equal to it and we jump to the same location. So IDA identifies this as an alternative of two values: 4121000, 4111001. Not the answer you're looking for? Browse other questions tagged ida assembly ollydbg decompilation executable or ask your own question.